BusinessWeek has an article on outsourcing that has some useful insights in it. The good: Outsourcing does not always save time or money. As many of knew when the outsourcing craze began to heat up, it is a lot of work to manage workers on the other side of the world who are 10 or 12 hours out of sync with your own office hours. In India, where IT outsourcing has helped fuel the economy, rapidly rising salaries and very high turnover (often above 50% a year) is driving U.S. businesses away. Some of that work is coming back to the United States, and there are opportunities in low cost of living rural areas to capitalize--if you have a tech-savvy workforce and affordable broadband. The bad news is that even though some outsourcing is moving out of India, some jobs are being moved to other low wage countries. What that means for the U.S. is that IT salaries are flat, and are likely to stay flat for some time. But I have maintained that many IT jobs have been priced too high for years--an artifact of the rapid growth in IT in the nineties. Some adjustments are not necessarily bad. But overall, we are in a world economy, like it or not, and your community is competing with other countries, not just the next county or the next state. And no matter how much local leaders may not see that or deny it, it is a fact. Every community in America has to be looking over its shoulder at the world economy now. We aren't in Kansas anymore. In a victory for personal privacy, a German court has ruled that if a customer requests it, an Internet Service Provider (ISP) must delete the IP log data that shows what a customer has been doing on the Internet and when. In the U.S., unfortunately, we are headed in the other direction, with the Federal government anxious to make ISPs responsible for retaining such information--forever! It is a huge and costly burden, with little justification, since most of us will never commit a crime that might require such data, and in my opinion, it is intrusive and an invasion of privacy. The magazine Killer App has a must read article on how fiber infrastructure has turned the rust belt economy of Wales (abandoned coal mines and steel mills) into a global powerhouse. The key: a steady investment in fiber over a period of years turned into a magnet for Knowledge Economy businesses looking for a reliable workforce, reasonable cost of living, and affordable broadband. Oh, and there was one more thing. Wales had excellent electrical power because of the former demands of the steel mills. The region was able to attract large data centers because Wales had an unbeatable one-two punch: world class fiber infrastructure AND reliable electric power. Finally, Wales has adopted an open access model, meaning they did not try to create a new government monopoly on telecom services. Instead, they are encouraging competition among service providers to ensure a rich variety of services that can meet any business need as well as keeping prices low (because of competition). This is an article you may want to print out and send to every local elected official and economic developer--especially those that think telecom is somebody else's problem. It is an excellent case study of a region that pulled its economy out of a nose dive and successfully created economic prosperity. Microsoft's MSN search and news site is trying to avoid Google's fate in Belgium, where a court told the search company to stop filching newspaper articles from the Web sites owned by the newspapers. Google would show the first few paragraphs of an article, and then provide a link to the rest of the article, claiming fair use. But of course, there were ads on the Google page and so Google was benefiting from someone else's copyrighted content. The Belgian courts told the company to cut it out. So Microsoft, which apparently does the same thing, is negotiating with the newspapers over the issue. The obvious solution is to share ad revenue with the papers. Less money for the search sites, but then, they would be doing things fairly and legally, which should not be difficult concepts. Here is a very short article about the falling price of DSL service in the U.S. Usually, when prices fall, it is a possible indicator that people are not buying enough of whatever is for sale, or that they supplier has "too much" of something. In the case of DSL, both is probably true. The phone companies have been investing heavily in upgrading their local phone systems to handle DSL, but with limited success, apparently, or they would not be cutting prices. Part of the problem is that the cable companies beat them to the punch several years ago. The cable companies got an early start not because they really believed the Internet thing was going to catch on, but because digital cable systems let them sell a lot more TV. It really did not cost much (relatively) to build systems that could also deliver Internet service. So a majority of broadband users in the U.S. have cable modem service rather than DSL. And it is often difficult to get your computer working with a new ISP, so most people tend to want to avoid switching unless there is a really compelling reason. And a $4.27 price differential is not enough, it seems, to get people to switch from cable to DSL. Anedotally, almost everywhere I visit in the U.S., people tell me that cable modem service is faster, more reliable, and tends to have better service than DSL provided by the phone companies. But the sad news is in the last paragraph of the article. While many communities are happy just to any broadband Internet service delivered over slow, last century copper systems, broadband prices in Japan also continue to drop. Service providers there are offering 100 megabit fiber service for $25.90 a month--less than we are paying for copper broadband 100-200 times slower. Ireland's research and higher education network, HEAnet, is getting configurable lightpaths. What are configurable lightpaths? It means that ordinary network users can configure a single wavelength of light on a fiber network from their computer or server to another computer or server on the same network (the computers could be hundreds or thousands of miles apart). A single lightpath can provide many gigabits of bandwidth with very little network delay, because the photons have a single path (lightpath) through the network. Much of the pioneering work was done in Canada and in Chicago, and a similar project has been underway in North America, called Starlight. Starlight already has fiber across the Atlantic and Pacific, and more schools, universities, and research labs are joining the effort. This new kind of network system (it is entirely compatible with the Internet) is starting the same way the original Internet started, with schools and universities. It is already moving out into industry, with companies like Cisco developing off the shelf equipment to implement lightpath networks. 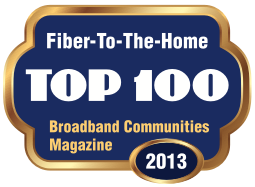 Lightpaths are one more reason for communities to start investing in fiber, now. Old-fashioned copper cable modem, telephone, and DSL networks don't support lightpaths and never will. Do you want your schools and businesses to be left behind? French get broadband two thousand times faster than the U.S. Prepare to be depressed. French Telecom has just announced that it is rolling out fiber service in major cities with download speeds of 2.5 Gigabits/second and upload speeds of 1.2 Gigabits/second. The cost? Seventy Euros, or about $85 US. Meanwhile, in the U.S., the heads of the major telecoms are patting us on the head and telling us we don't need superhighways to our homes, that DSL sidwalks are just fine. A typical DSL connection in the U.S. is about two thousand times slower than the Gigabit service being rolled out in France. This article is in French, but you can see the speeds discussed in the second paragraph. In an interesting tale of two companies, Apple has dumped its experiment in offshoring telephone support to India after just one month. Meanwhile, Dell is rapidly expanding its offshore tech support. What's going on? Apple, while not perfect, consistently gets high ratings from consumers for support. Dell, on the other hand, has been receiving a steady stream of criticism lately for poor customer support. I attribute the difference to finances. Apple is extremely profitable, and seems to have figured out that taking good care of customers pays off over the long term. Dell, on the other hand, is on the ropes financially and appears to be trying to save its way out of a money hole. In my experience, cost-cutting at the expense of highly visible parts of the company like customer service never works out well. Dell's slide will likely continue. Personally, I have rarely had a good experience with offshore customer support. I've observed two chronic problems. First, the heavy accents, even with someone who might speak English as a first language, often makes conversations quite difficult. And second, offshore staff seem to be often stuck following a script when trying to figure out what the customer wants. If the problem doesn't match the script, they can't adapt. I find that less so with American-based customer support (though not always). The money will be used for a variety of projects, including high speed connections to all schools, government offices, and health facilities; high speed broadband for entertainment, culture, and sports facilities; and for public transportation and environmental monitoring. While the Koreans are putting substantial investments into technology that will transform their economy, we are still debating whether broadband should be 200 kilobits/second (the FCC definition) or if we should jump things up to the 1-2 megabits/second favored by the telephone and cable companies (which is about 1% of South Korea's broadband target). Here is my presentation from the morning keynote. Thanks for your interest. You can find more handouts and documents in the Library. If you are interested in the plastic microduct I passed around at the meeting, you can get more information about Emtelle FibreFlow here. You can also visit the home page of Technology Futures for regular updates and technology news and what it means for communities. I'm at the Pacific Community Network Association Annual Conference in Vancouver, British Columbia. I gave the opening keynote this morning. I am really impressed with the energy and enthusiasm for broadband here. Folks up here understand better than many U.S. communities that broadband--affordable broadband--is essential to their communites. The province of British Columbia has hundreds of local community technology projects--active, vibrant efforts that are providing access, training, and services to hundreds of thousands of people in rural communities. I'll be posting more over the next couple of days. Stay tuned. Northern Ireland is the first country in Europe to have 100% availability of broadband (typically DSL) to every home and business. Government investments helped get the job done. "It would have been impossible to have achieved our export growth without broadband internet access which came to Rathfriland in 2004..."
A small northern Ireland company is expanding internationally because of broadband. What could firms in your area do with affordable broadband? This report says that Europe is starting to invest again in nuclear power [link no longer available]. Like the U.S., most of Europe stopped building nuclear power plants after the 1970s Three Mile Island disaster. If you look strictly at deaths directly attributable to nuclear power and compare them to deaths from coal power, coal loses every time. There are mining disasters regularly, with the latest tragedy right here in Appalachia. Nuclear's biggest problem was that during the sixties and seventies, every nuclear power plant designed was a one-off...that is, a custom design. It's like building cars by hand--expensive and increases the risk of problems. What we need is just one or two standard nuclear power plant designs that are well understood. Training and safety systems would be standardized, it would much easier to evaluate and test components, and the cost of off the shelf power plants would be much lower. Nuclear power plants have virtually no emissions, do not generate acid rain or carbon dioxide, and don't require transporting large amounts of fuel (coal, oil, natural gas) across great distances. France generates 80% of its electricity from nuclear power, and has done so safely for more than twenty years. The U.S. needs to take another look at nuclear. Here is a report from Denmark about how one group is trying to nurture and promote the growth of microbusinesses. Stick with the article to the end, and you will find a useful list of activities and projects that would apply in any community or region. Does your economic development game plan include these kinds of activities?